房協既職員 , 好心你地啦 , 你夠膽既 , 就黑紙白字覆我 , o個個水閘既作用係用黎控制出水量 , 我敢講 , 如果你夠膽咁覆 , 一定成為各份報紙既頭條 , 咁既籍口都講得出 ? 有位保險既朋友同我講過 , 有個Case自己室內總水閘壞左 , 唔整 , 結果有廁所爆水喉 , 浸緊出走廊 (理論上開左間屋既總水閘 , 就解決左) , 打落去管理處 , 就係咁岩無人聽 , 結果浸壞左架Lift , 邊個賠 ? 另一個問題 , 房協既職員又會同你講 , 上面個二個角閥 (鵝蛋形)既 , 一樣可以閘水 . 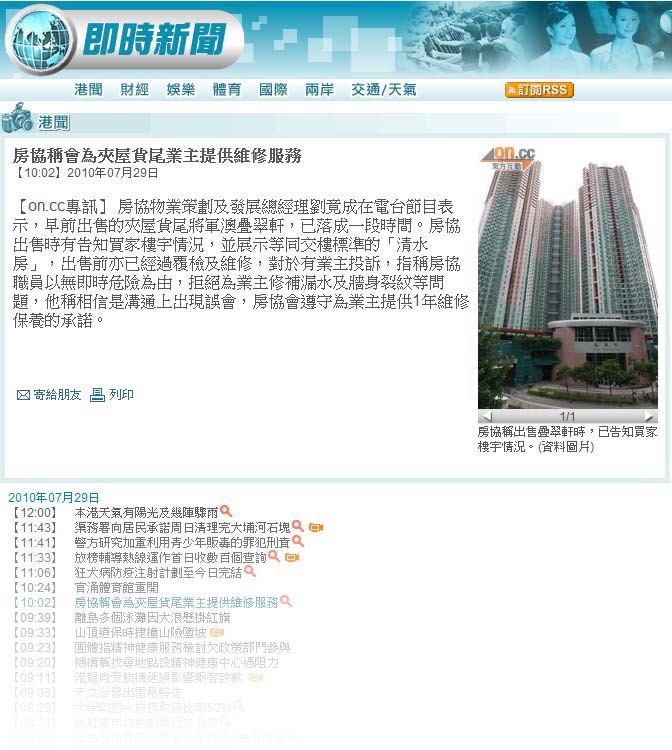 如果各位仲遇到房協既職員再咁樣解釋去"耍"你地 , 請大家記低同佢對話既日期 , 時間 , 同埋個位職員既姓名 , 再e-mail 俾我地 ,有埋對話錄音仲好 , 我地自然有人會做野. 4. 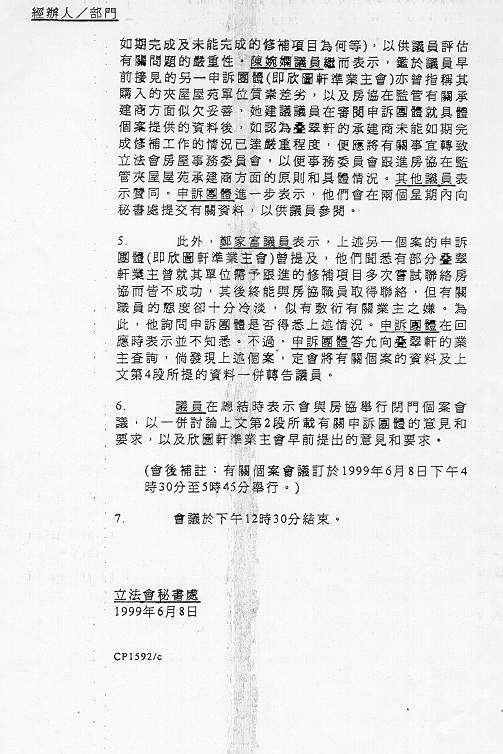 By letter dated 11 August 2000 addressed to the plaintiff, Messrs Baker and Mckenzie on behalf of HKHS asserted that the 2nd defendant had failed to duly perform and observe the terms, provisions, stipulations and specifications of the building contract with the result that HKHS had suffered loss and damage. It was alleged that the 2nd defendant had failed to carry out the works to the reasonable satisfaction of the architect and failed to complete these works by the date required by the contract. The total loss and damages certified by the architect was in the sum of $236,525,000. By the said letter, Messrs Baker and Mckenzie demanded from the plaintiff the payment of the sum of $65,615,000, the amount covered by the performance bond. （2）“The total loss and damages certified by the architect was in the sum of $236,525,000(include delay completion). 我們有權懷疑這些單位現在仍然是 not reasonable satisfaction 和 它l引致的 loss and damage價值不少. 既然房協有權因耀榮（承建商）不到達到 reasonable satisfaction 而 claim 番loss and damage, 我們也有權 claim番我地嘅loss and damage. 1. The plaintiff is an insurance company. Its claim against the 1st and 2nd defendants is under a general agreement of indemnity ("the agreement") made on or about 30 November 1995 between the 1st and 2nd defendants of the one part as "the indemnitor" and the plaintiff of the other part as "the surety". 2. The 1st and 2nd defendants were desirous of the plaintiff executing or procuring the execution of a bond or bonds on behalf of them or which they might desire to furnish for any purpose whatsoever. Pursuant to the agreement, the plaintiff together with the 2nd defendant jointly and severally executed on or about 5 March 1996 a bond ("the performance bond") in the sum of $65,615,000 conditioned for the due performance by the 2nd defendant of a building contract entered or to be entered into between the Hong Kong Housing Society ("HKHS") as employer and the 2nd defendant as the main contractor for the carrying out and completion of the building works relating to the Sandwich Class Housing Development at Tseung Kwan O, Area 24, Tseung Kwan O, Kowloon. 3. The 2nd defendant was the main contractor under the building contract. 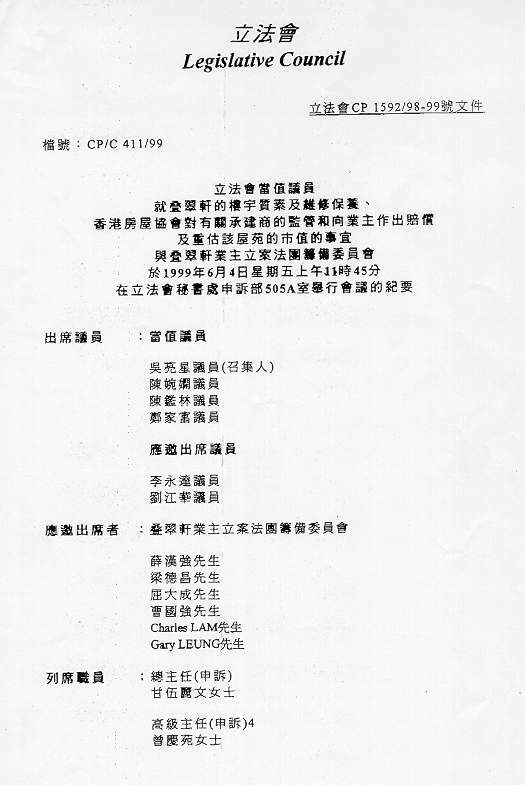 The formal building contract was executed on or about 29 July 1996 between HKHS as the employer and the 2nd defendant as the main contractor. 4. 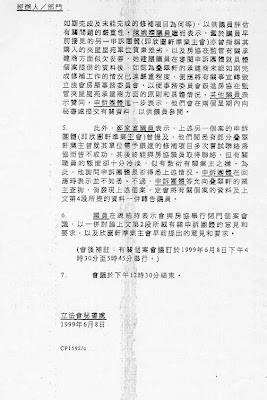 By letter dated 11 August 2000 addressed to the plaintiff, Messrs Baker and Mckenzie on behalf of HKHS asserted that the 2nd defendant had failed to duly perform and observe the terms, provisions, stipulations and specifications of the building contract with the result that HKHS had suffered loss and damage. It was alleged that the 2nd defendant had failed to carry out the works to the reasonable satisfaction of the architect and failed to complete these works by the date required by the contract. The total loss and damages certified by the architect was in the sum of $236,525,000. By the said letter, Messrs Baker and Mckenzie demanded from the plaintiff the payment of the sum of $65,615,000, the amount covered by the performance bond. Further particulars were provided to the plaintiff's solicitors by Messrs Baker and Mckenzie in their letter dated 14 September 2000. They also asked for confirmation that the plaintiff would make payment as demanded. 5. By letter dated 19 September 2000 from the plaintiff's solicitors to the 1st and 2nd defendants respectively, the plaintiff called upon them to perform their obligations under the agreement in particular, under cl. 12 thereof. A demand was made that they deposit cash or collateral security in the sum of $65,615,000. They failed to do so and the writ was issued on 8 November 2000. 6. It is common ground that the plaintiff has not yet acceded to HKHS's demand to pay the said sum of $65,615,000 or any part thereof and that HKHS has not brought any proceedings against the plaintiff for the recovery thereof. The 2nd defendant denies that it has been in default under the building contract but instead asserts that HKHS has been in default and that HKHS is indebted to it. 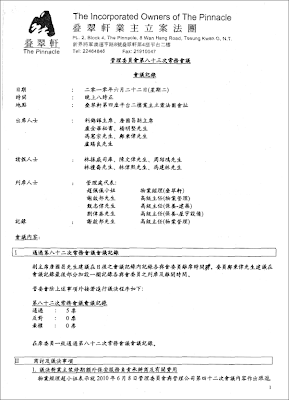 The 2nd defendant and HKHS are currently engaged in arbitration in connection with the building contract and it is unlikely that any award will be made before mid 2002 at the earliest. 7. It is not necessary here to set out the terms of the performance bond. It was submitted on behalf of the defendants that upon its true construction the performance bond was no more than a guarantee. On the authorities cited namely, Trafalgar House Construction (Regions) Limited v General Surety and Guarantee Co. Ltd.  3 All ER 737 and Tins' Industrial Co. Ltd. v Kono Insurance Ltd.  2 HKLR 36, it appears to be well established that a performance bond, like the performance bond in this case, is in the nature of a guarantee. On those authorities, the plaintiff would only be liable to pay HKHS under the performance bond upon proof of default on the part of the 2nd defendant in the performance of the building contract and proof of loss and damages. 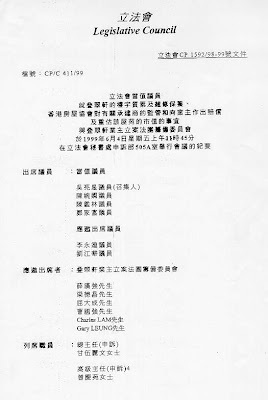 The plaintiff itself has taken this stand with Messrs Baker and Mckenzie in correspondence that its solicitors Messrs T S Tong & Co. had with Messrs Baker and Mckenzie in particular, the letter dated 20 November 2000. 8. The plaintiff claims against the 1st and 2nd defendants under the agreement in particular, under cl. 12 thereof. In this application for summary judgment under O.14, RHC before me, Mr. Ma, SC leading Mr. Chow, informed me that he was no longer seeking summary judgment under para. (3) of the summons namely, the declaration sought but that he was seeking summary judgment under paras. (1), (2) as well as interest and costs under paras. (4) and (5). "To indemnify the [plaintiff] against all actions, claims proceedings, demands, liabilities, damages, costs, expenses and/or losses whatsoever in respect of any Bond or Bonds........... ."
"In the event of any payment being made by the [plaintiff] in respect of any actions, proceedings, claims, demands, liability, damages, costs, expenses and losses whatsoever incurred in respect of any Bond or Bonds the [1st and 2nd defendants] shall on demand, pay to the [plaintiff] or any of its associated companies for any and all money incurred by the [plaintiff] without delay and without further documentary proof on the part of the [plaintiff] that such payment was made by the [plaintiff] and is repayable by the [1st and 2nd defendants] to the [plaintiff]." "The [1st and 2nd defendants] further agree that upon any claim or commencement of any suit against the [plaintiff], in any matter indirectly or directly connected to any of the said contracts or Suretyship instrument, shall, upon demand, deposit with the [plaintiff] cash or collateral security in an amount sufficient to indemnify it upto the full amount demanded." 11. The obligation under cl. 12 is additional to the obligations under cls. 1 and 2. It is necessary to construe this clause. The words used should be given their ordinary and natural meaning. At the outset it can clearly be seen that the obligation under this clause is additional to the obligations of the defendants under the earlier clauses. Thus the use of the words "further agree". The obligation clearly is to deposit with the plaintiff cash or collateral security "in an amount sufficient to indemnify it upto the full amount demanded". The obligation under this clause is not to indemnify the plaintiff but simply to deposit cash or collateral security. The indemnity to the plaintiff has already been provided for in cls. 1 and 2. 12. 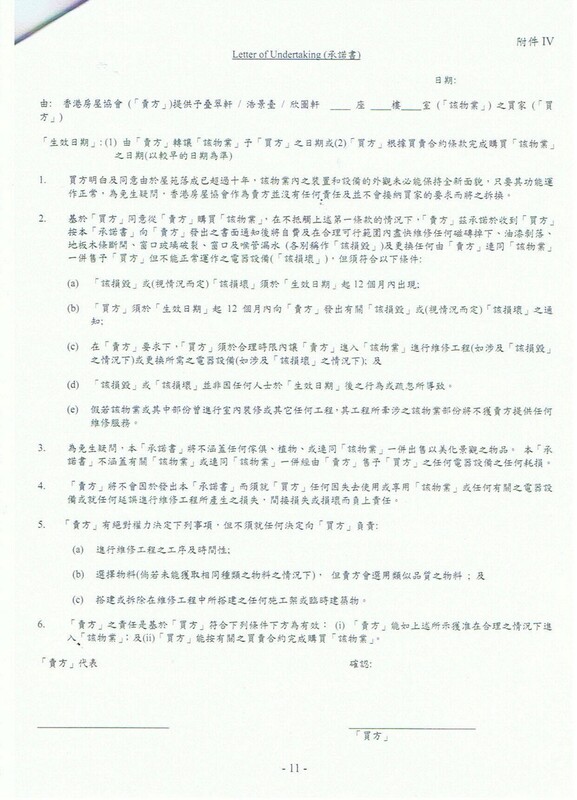 As to the meaning of "claim", Mr. Ma submitted that there was no reason why its natural meaning should not apply. I agree with Mr. Ma. 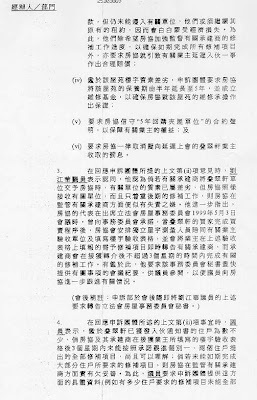 Mr. Lee, counsel for the 1st defendant, submitted that in cls. 1 and 2 a distinction is drawn between "claim" and "demand" as both words are used there and that therefore the word "claim" as used in cl. 12 cannot mean the same thing as "demand" which is what Messrs Baker and Mckenzie's letter should be construed as namely, only a "demand" but not a "claim". I cannot accept this submission. The fact that the words "claims" and "demands" are used in cls. 1 and 2 but not in cl. 12 does not assist the defendants. I agree with Mr. Ma that in cls. 1 and 2 there appears to be an overlap between "claims" and "demands". Also, the very last word "demanded" in cl. 12 suggests that there has been an overlap in the use of the words "claim" and "demand". A letter of demand can be both a "claim" and "a demand". 13. I was referred to A/S Rendal v Arcos Ltd. (1937) 58 LLR 287 where "notice of a claim" under a charter party was construed to mean not a precisely formulated claim with full details, but such notice as will enable the party to whom it is given to take steps to meet the claim by preparing and obtaining appropriate evidence for that purpose (in particular, see p. 292). And in Re St. Paul Fire and Marine Insurance Co. and Guardian Insurance Co. of Canada 1 D.L.R. (4th ed.) 342 the Ontario Court of Appeal held, inter alia, that the giving of notice amounted to a "claim made". It is clear from the passages in the judgments of Goodman, JA @349 and Thorson, JA @352 and 353 that the words "claim made" include but are broader than the words "writs issued" or "suits brought". 14. Under cl. 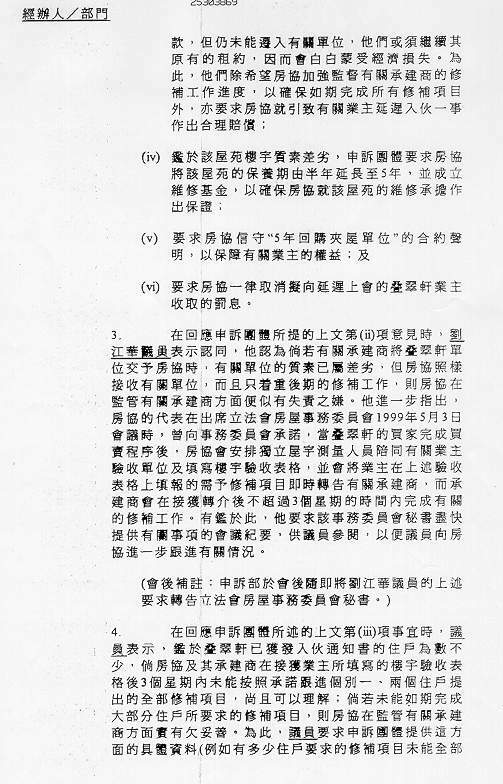 12 of the agreement the words used are "any claim or commencement of any suit against the [plaintiff]". I am satisfied that the words "any claim .......... against the [plaintiff]" are broader than the commencement of any suit. In my judgment it matters not that no action has been instituted by HKHS against the plaintiff. 15. The letter of Messrs Baker and Mckenzie dated 11 August 2000 asserted that the 2nd defendant was in breach of the building contract and provided a quantification of the claim as certified by the architect. A demand was made for payment of $65,615,000 under the performance bond. 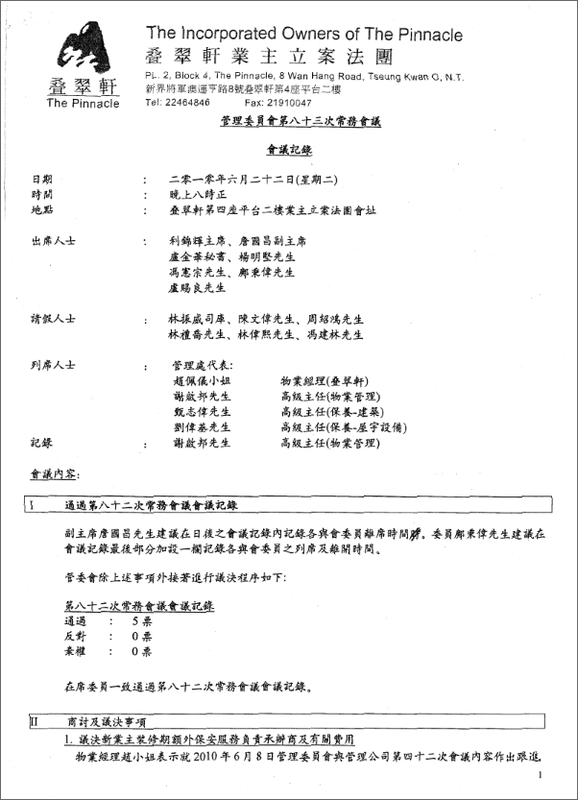 Further details were provided by letter dated 14 September 2000. It seems to me to be beyond doubt that under cl. 12 there was a "claim" against the plaintiff and that there has been a demand made on the 1st and 2nd defendants as required by cl. 12. 16. 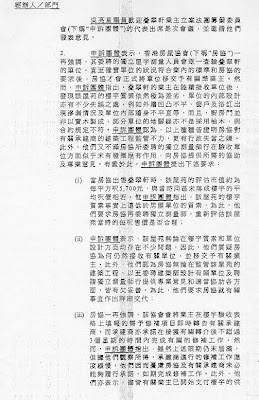 Mr. Lee submitted that the obligation under cl. 12 arises only after payment has been made by the plaintiff under the performance bond. Mr. Smith, SC for the 2nd defendant, submitted that the word "claim" must be construed to include only such a claim which could properly be made under the surety instrument namely, the performance bond, and that as there was as yet no liability of the plaintiff under the performance bond there could be no "claim" under cl. 12. I cannot accept these submissions. I see no reason to construe the word "claim" in the way suggested. It would render cl. 12 meaningless and otiose. The commercial purpose of cl. 12 was to provide the plaintiff with the deposit of cash or collateral security. As Mr. Ma has correctly submitted, nothing in cl. 12 requires the plaintiff or anyone else to evaluate the merits or demerits of HKHS's underlying claim against the 2nd defendant under the building contract. There is no need to evaluate the merit or the merits of HKHS's underlying claim against the 2nd defendant under the building contract. There is no need for the plaintiff to pay out on the performance bond until after liability against the 2nd defendant has been established and damages have been proved. This only means that the liability to indemnify under cl. 1 and the payment under cl. 2 of the agreement has not yet arisen. But the obligation under cl. 12 is additional. Once cl. 12 is activated the 1st and 2nd defendants' obligations are to deposit cash or collateral security. 17. It was also submitted by Mr. Smith that under cl. 12 what had to be deposited was cash or collateral security in an amount sufficient to indemnify the plaintiff "upto" and not "in" the full amount demanded. It was submitted that the sufficiency of the indemnity could be less than the amount demanded. That may well be so but in my view that does not assist the defendants. The effect and meaning of cl. 12 is in my view clear. If a "claim" is made against the plaintiff under the performance bond, as has been the case here, the plaintiff can in turn demand that the 1st and 2nd defendants deposit cash or collateral security up to the full amount demanded. The full amount demanded is the amount claimed namely, the amount of the performance bond $65,615,000. There is no requirement at all under cl. 12 to evaluate the underlying claim of HKHS against the 2nd defendant so as to arrive at a suitable figure of the deposit. The amount to be deposited by cash or collateral security is clearly stated to be "in an amount sufficient to indemnify it upto the full amount demanded". That amount is $65,615,000. 18. It was also pointed out by Mr. Lee that cl. 3 of the agreement provided for a deposit of the full amount of any bond issued on behalf of the 1st and 2nd defendants in the event of the liquidation or appointment of a receiver of the assets of the 1st and 2nd defendants. Under cl. 3 the plaintiff could use the money deposited to settle any claim and costs, expenses and/or loss but that the surplus, if any, was to be refunded to the defendants with interest accrued. 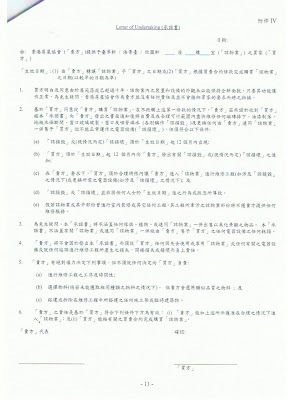 It was pointed out that there was no similar provision for the return of surplus, if any, to the defendants under cl. 12 after payment of sums due under the performance bond. It was also submitted by Mr. Smith that as there was no provision for the payment of interest or the refund of the cash or collateral security deposited in the event that the 2nd defendant succeeded against HKHS in the arbitration, there was, therefore, an element of vagueness in cl. 12. I do not see how any of these matters assist the defendants. The meaning of cl. 12 is clear. There is nothing uncertain about its terms. The fact that there is no express provision dealing either with repayment in the event that the 2nd defendant succeeds against HKHS or interest does not make cl. 12 uncertain. The meaning and effect of cl. 12 is clear and enforceable. 19. Mr. Smith also criticised para. 4 of the statement of claim and submitted that it was equivocal as to whether the performance bond was executed pursuant to the agreement. The pleading is clear in my view and at most what has been raised is purely a technical point as to the use of the words "and/or at the request of the 1st and/or 2nd Defendants" pleaded in para. 4. No one has suggested that the performance bond was not executed pursuant to the agreement and this does not raise any triable issue. 20. In the circumstances, I am satisfied that no triable issue has been raised on the liability of the 1st and 2nd defendants under cl. 12 and the plaintiff is entitled to summary judgment. 21. I am, however, not satisfied that the plaintiff is entitled to summary judgment on its claim for interest. It seems to me that under the performance bond the plaintiff is liable to pay HKHS only after liability against the 2nd defendant has been established and damages have been proved. There is no question of any interest being payable until those events have occurred. There will be unconditional leave to defend as to the claim for interest as well as the claim for a declaration. 呢 d 問題 , 我地一步都唔可以退. 綜合各位C Hing 既經驗 , 加上今日本人既經驗 , 發覺佢地答問題係有一定要公式 , 既然你有Template , 我地點會無呀 ? 另外 , 同佢地對答 , 最緊要惡 同埋要快過佢講 , 令佢知道我地係知道佢地既答覆 , 我地係唔會接受既! 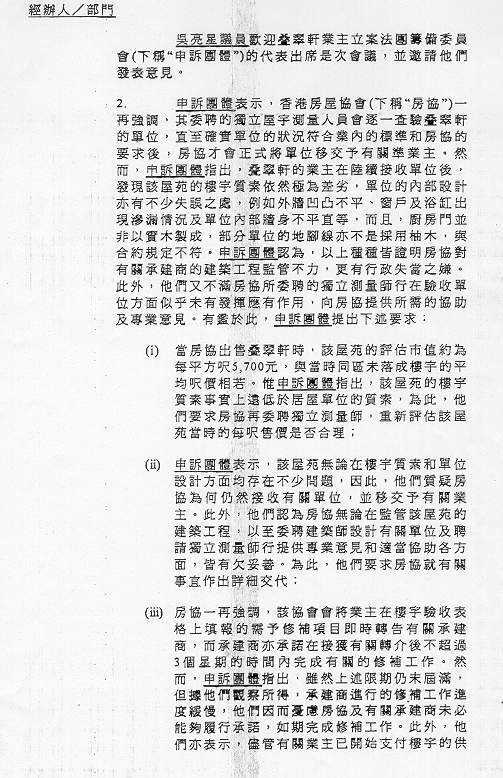 當佢一提到 室內水閘總制 , 佢第一句想開口 , 我已經叫停佢. "我知你會同我講乜 , 一係話上面有二個蛋型制係可以關左廚房洗手盤既水 , 一係話擰盡左都係有水流既 , 一係話水閘總制其實用黎控制出水量"
"你唔駛再講 , 總之你答我 室內水閘總制 既功能係乜 ? " 我 : "依家閘唔到水 , 功能有問題 , 你約時間上黎整啦"
如果你要我接受示範單位既浴缸龍頭同去水位唔同方向 既話 , 你就同我執返牆身唔好灣灣曲曲 , 你揀 , 浴缸 or 牆身 ? 係 iii) 浴缸功能有問題 , 唔可以趟下! 唔好分散我注意力! 我 : "得啦 , 你唔駛講 , 我知你想講乜 , 你話示範單位係咁 , 功能無問題 , 跟住你又會講 龍頭出到水 , 去水去到水 , 功能無問題"
"我依家同 你講 龍頭出到水 , 去水去到水 係龍頭同去水無問題 , 我依家係講緊浴缸"
"企缸 係企係度沖涼 , 浴缸係瞓係度沖涼 , 依家我瞓唔到係度沖涼 , 浴缸功能有問題 , 你明唔明"
我 : "我都知你打份工啫 , 不過你d 答案都係令我好忟lor"